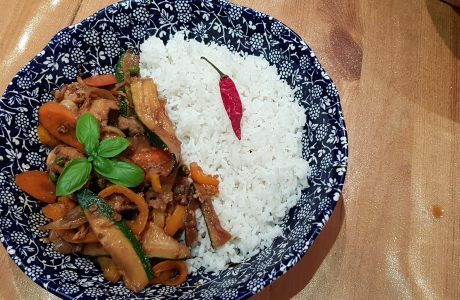 One of the recipes we chose was Stir Fried Chicken with chillies and holy basil, which in Thai is Pad Krapow Gai. This is one of Jirapan’s most popular recipes. She is a fantastic chef and a brilliant teacher. This is a classic street food dish which is perfect for a weekday meal. This is a gorgeous dish for most palettes. It is up to you how spicy you make it through how many chillies you add. We have it tingly but have a go and you can always add more!